TAG Heuer CARRERA Heuer-02T: a chronograph with Tourbillon for under 15'000 CHF. It was a rumour just two years ago during Baselworld: TAG Heuer was preparing a Tourbillon for under 15'000 CHF! Was it really possible to combine the rules, and prices, of the sport watches with those of Haute Horlogerie? Two years later the watch is there. It's a real Tourbillon. And a chronograph, and a chronometer. 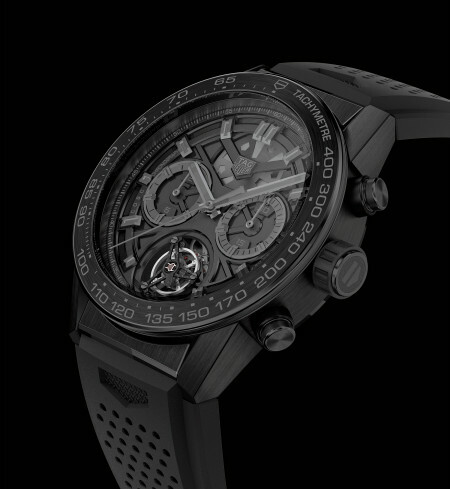 comes the TAG Heuer Carrera Heuer-02T, a COSC-certified automatic chronograph combined with a titanium and carbon flying tourbillon. part of a limited edition of 250 numbered pieces. (one of TAG Heuer’s key strengths), and the aesthetically-pleasing tourbillon. An industrial framework was developed to optimise assembly in TAG Heuer’s workshops at its Chevenez site. It houses a lightweight tourbillon hand-crafted by 4 watchmakers, inspired by the Monaco V4’s tourbillon, which has central sections made from titanium and a carbon top section. This tourbillon offers a power reserve in excess of 65 hours. the tourbillon, the balance spring is produced by the brand’s Swiss partner, Atokalpa. A watch we are certainly impatient to discover at Baselworld 2016!